Everything you need to know to connect with your audience how, when, and where they want. Conversational marketing from the experts. How did your grandparents, parents, and younger siblings grow up gossiping about the latest party? I bet they’d all have different answers. Don’t believe me? Let’s take a trip back in time. First, we sent letters. If you think handwriting a card took a long time, think about the time it took to receive a response by plane, train … or pony. Years later, the fax machine allowed us to send messages and images over telephone lines. Unfortunately, the earliest machines cost tens of thousands of dollars, and you still had to create a hard copy of your message. Then came “leave a message after the beep” … voicemail. We've all put off listening to that 3-minute long message. It’s easy to ignore or it can be the start of an endless game of phone “tag”. After voicemail came "you've got mail." While revolutionary, inboxes quickly became overwhelmed. Your thoughtful email lay forgotten under a pile of spam and promotional messages. Then the people who brought us email rolled out AIM or instant messenger. As the name implies, this was the first instant messaging service. Except your friends weren’t always online. Sometimes their away message was set to Outkast lyrics. Shake it like a Polaroid picture, anyone? Around the same time, SMS texts hit mobile phones everywhere. You can now text your friend all of the essential party details and 🎉🎉🎉emojis. Finally, we arrived at live chat. Live chat allows for instantaneous responses. You write a quick message and see those three little dots signaling a reply. The days of waiting for weeks to hear from someone are over – conversations are always happening. With each new iteration of technology, our accepted response time has changed — friends make plans faster, families stay closer, and businesses provide answers instantly. In the age of live chat, customers expect conversations to happen how, when, and where they want. Sounds intimidating, right? Don't worry; it's not as complicated as you think. While the technology we use to communicate has changed, the core elements of communication have stayed the same. People always have and always will expect conversations to be helpful, personal, and empathetic. The only difference now is we have the technology to have those conversations at scale. That’s the power of conversational marketing. Let’s talk about conversational marketing and its benefits, how it will help your business grow, and what you need to build a successful conversational marketing strategy. Conversational marketing is the ability to have 1:1 personal conversations across multiple channels – meeting customers how, when, and where they want. It is more than just live chat – it extends to phone calls, texts, Facebook Messenger, email, Slack, and more — basically any channel in which a customer wants to communicate with your brand. For example, many startups have created user groups on Slack. These groups allow customers and prospects to ask questions and get advice on a channel they're already using to communicate throughout the workday … but wait, weren't we talking about conversational marketing? How did we get started talking about customer support? See, here's the thing with live chat, it's an incredibly powerful communication channel that has a strange way of breaking down the walls between support, sales, and marketing. Sure, conversational marketing is the topic of the day, but we believe it is just one small piece of the puzzle. Conversations should take place across your entire business. In the future, businesses will need to develop a comprehensive conversational growth strategy to deliver a better customer experience throughout the entire customer journey. 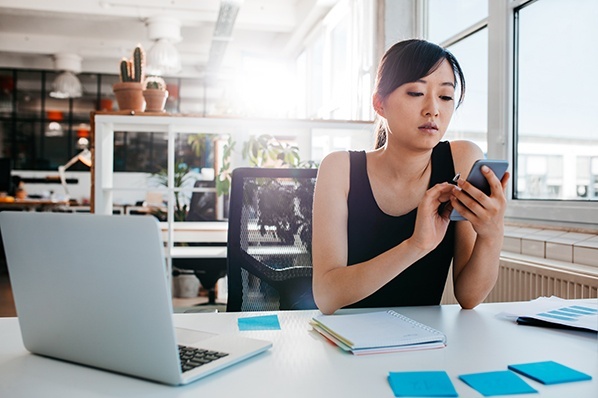 Conversational sales will play a huge role in helping reps connect with prospects in a more helpful, organic way. And customer success teams have already seen significant benefits using chat as one of their many support tools. While you’re developing your conversational marketing strategy, consider how it can impact every part of your business. OK, you may be thinking, "conversational marketing sounds a lot like my current marketing strategy. I'm on multiple channels. I'm having conversations with my audience." If you're a customer-focused marketer, chances are you're almost there. Here are the four key components of conversational marketing and how to best refine your strategy. Conversational marketing is an asynchronous relationship. Meaning conversations should occur whenever the customer prefers — whether that's in real-time, after finishing their meeting, or later that night when they have a spare moment. While it's important for businesses to be able to chat in real-time, it's just as important for them to be able to finish a conversation at whatever pace the customer wants. Sometimes that means starting a conversation at 7 a.m. over their first cup of coffee and finishing at 9 p.m. after they've put their kids to bed. HubSpot Co-Founder Dharmesh Shah says, "Customers should be able to pick up things right where they left off whenever it is convenient for them to continue. The key is to remember that conversational marketing should be designed around the needs of the customer — not the needs of the business." Because conversations happen on customer-time, all conversations need to be scalable. A customer doesn’t care if you’re talking with 50, 500, or 5,000 other people — they only care about the issue they need to be solved. Businesses, especially SMBs, shouldn’t get left behind due to a lack of resources or manpower. This is where chatbots come in. Bots make 24/7 support possible by providing answers to common questions based on data that already exists. Business shouldn't sacrifice human interaction for scale. Rather, bots offer quick access to information or a human. Conversations can’t exist in a vacuum; they need context and should get smarter as you collect more information. This is important for two reasons. First, it’s what customers expect. Think about it: If you called a company yesterday to report a defect in something you ordered, and then you chat them the next day about needing return instructions, you'd expect the person you're talking with to have access to previous interactions and know which product you’re sending back. Second, context is what makes messaging convenient. Without it, bots or a support rep would need to ask people the same qualifying questions every time they interacted with them — wasting their time and testing their patience. If you’ve ever called customer support, you know how frustrating it is to repeat your account number time after time as you’re passed around to different departments. People want to get the answer to their question as quickly as possible and with the smallest amount of effort. This is why it’s so important to make a CRM part of your conversational marketing strategy. Context means gathering, storing, and making accessible customer data — from recent orders to visits to pricing pages to their job title. The more you know about the customer and the more you can demonstrate that in the conversation, the more helpful you’ll be. Inbound Marketing is about providing value to your audience and meeting them where they are. Conversational marketing is just a part of that now — thanks to the mass adoption of messaging and new tools and technology. Some people equate conversational marketing with live chat — something that’s been around for a while. But it’s much more than that. Conversational marketing isn’t about a single tool. While Facebook Messenger, Slack, SMS, email, and others allow conversations to happen, this is about the changing communication preferences of consumers that in turn, should change how you view one-to-one conversations. For example, social media giant Facebook is drastically changing the way its users engage with businesses. There are over 65 million business pages on Facebook, and over 2 billion messages are exchanged with these businesses each month on Facebook Messenger. That's a lot of conversations happening. Consumers are using Facebook Messenger and other popular messaging platforms to get content delivered, shop and buy, and access support. With access to new technology, businesses can use these emerging platforms to easily meet consumers where they are already spending their time. Still not convinced? 85% of consumers spend their time in five popular apps, including WhatsApp and Facebook Messenger. And according to Facebook’s February earnings, WhatsApp and Facebook Messenger had 1.5 billion and 1.3 billion monthly active users, respectively. But remember, businesses should not only be communicating on a variety of channels, but they should also be prepared to continue those conversations across all channels without missing a beat. Conversational marketing isn’t new — we have conversations every day, and as you saw from the timeline above, it’s been that way for a while. So why wouldn’t we use tools that optimize conversations for business? Let’s talk about a few of the key benefits. First, conversational marketing is a more delightful way for customers to get answers. People are increasingly turning to mobile to shop and make purchases. As a result, more people are interacting with content that is more mobile friendly. 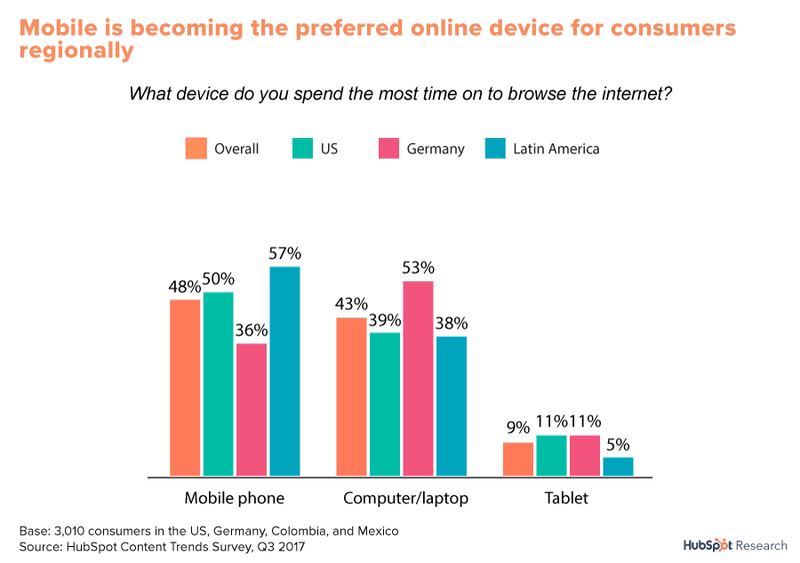 Consumers that use their phone as their primary internet device have grown to prefer video content, social content, and messaging-based interactions. Think about how many times you pick up your phone during the day. According to TechCrunch, consumers spend 5 hours per day on their phones. It makes sense. I’m guessing it’s your first line of defense when looking up an answer to a quick question. Conversational marketing channels like messaging apps and email are innately mobile friendly. It’s a lot easier to chat with a rep or even a bot to get an answer than spend time scrolling and clicking through a company’s website. Messaging apps allow customers to provide information specific to their problem so business can give quick, personalized support. HubSpot recently experimented with delivering content offers via Facebook Messenger and saw some incredible results – the test saw a 2.5X increase in open rates and 6X the number of clicks when compared to email. This improved performance is due in part to the channel's push notifications, but it also aligns with how people want to shop, buy, and engage with companies today. And conversational marketing doesn’t just present an opportunity in the U.S. In fact, in many regions, messaging apps like WeChat and WhatsApp are the primary channel for both personal and professional communication. Second, conversational marketing is a great way to gain new, valuable insights about your customers. Think about it, when else do your customers tell you in their own words what they want to do, learn, or change? You don’t get that candor with a website or an advertisement. And with conversational marketing, you can gather that data at scale. This especially holds true for messaging channels. Chat interfaces can record data that can then be used to optimize for better customer interactions, product improvements, more helpful content, and more. 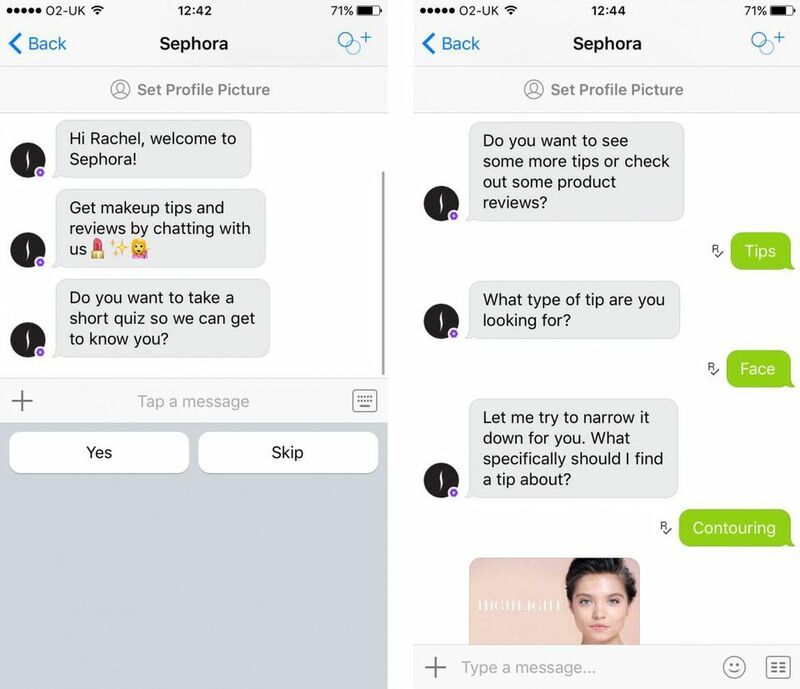 For example, Sephora used Kik messenger to learn more about their target market by asking them if they wanted to participate in a quick, social-like quiz about their beauty habits. Once users accepted, they answered questions about their age, makeup preferences, and favorite products. From there, the app was able to deliver relevant content such as how-to videos and product reviews based on the individual’s answers. A chatbot makes it easier for customers to find and purchase products they like and frees up human employees for other tasks. CNN also uses a bot to provide their audience with tailored content based on keywords. Users simply send the bot a message with a topic they’re interested in, and it will send back related news stories. Not only is it a quick, easy way for readers to get the news they care about most, CNN is collecting valuable consumer data with every chat. Once businesses collect consumer data, they can use it to define trends and make more informed decisions. For example, imagine that your company redesigned its website or provided a discount on merchandise. If a prospect or customer has a difficult time navigating the new website or applying the coupon, they can live chat with a representative to receive instructions on how to best navigate the issue. Not only does live chat help solve the immediate customer’s concerns and keep them on the site, the information from that chat can help you determine if you need to fix a part of your website’s UX or send out more detailed instructions on how to apply the discount. Being able to determine common customer pain points as they occur can save a business thousands of dollars. And not only is conversational marketing data helpful for recognizing tech issues and common customer pain points, it also can identify opportunities for cross-sell and up-sell. If a customer is chatting with a rep about a product they are considering buying, the rep could take that opportunity to point out other items customers frequently bought based on previous interactions. Third, conversational marketing is a great way to build relationships. With messaging apps and social media, we’ve found a way to talk with more friends, more frequently. Conversational marketing can drive lead generation by reaching new audiences on different channels or by giving people a more convenient way to get in touch with support. 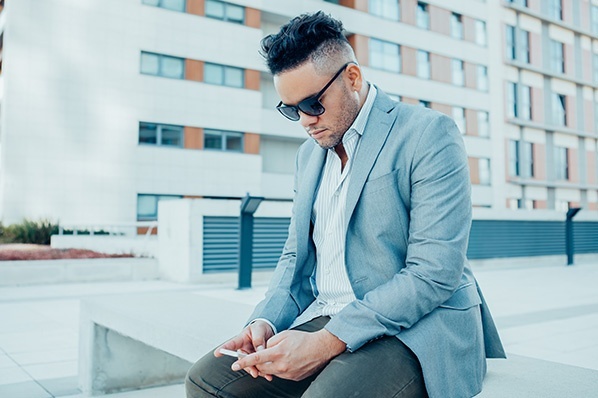 According to Harvard Business Review, messaging apps “provide a continuous thread between customers and brands.” This thread allows for continuous communication which makes conversations more natural and “opportunities to cross-sell, encourage sharing, solicit input, and flow seamlessly between commerce and support” more frequent. “Questions that are awkward or annoying coming from a brand are socially acceptable and even welcome in chatbot interactions." Bots allow companies to collect a lot of information in a natural way. Instead of coming face-to-face with a long form, customers can share a little information over the course of multiple conversations. HubSpot was able to attract 20% more qualified leads by merely adding live chat as a communication channel. What would a 20% increase in qualified leads look like for your business? And not only is conversational marketing more convenient for customers, it’s also a great way to show off your brand’s personality. Through copywriting, images, emojis, and videos, you can give your messaging conversations a personality — one that reinforces your brand. Customers and prospects are likely to keep engaging with your brand if you make it enjoyable and easy to do so! For example, HubSpot allowed people to register for its Four Days of Facebook Campaign through multiple channels, including Facebook Messenger. Users loved the conversational UI and were quick to encourage their friends and coworkers to sign up as well. And success wasn’t just about getting people to register for the live event. Facebook Messenger was the highest converting source of new product users to HubSpot Marketing Free via the campaign. At this point, you've probably noticed the similarities between the core ideas behind conversational marketing and inbound marketing. That’s because conversational marketing is a piece of inbound marketing, just like email marketing or blogging. Inbound Marketing is all about creating value where your target customer is spending their time — that could mean writing a blog, interacting on social media, or sharing a video on YouTube. Now that technology has made conversational marketing a possibility, it’s a key part of inbound marketing. "Conversation marketing is not new. Not only have we long been having conversations with customers — even the term itself has been around for at least a decade. The reason for the renewed interest in conversational marketing is that because of advances in technology and shifts in consumer behavior, conversational marketing can now happen at scale. We can have direct, one-to-one conversations with individual customers on their timeline — not ours." Although conversations are nothing new, our ability to have 1:1 conversations at this scale and across multiple channels is. With inbound marketing, you can first attract potential customers to your brand. You can then use conversational marketing to allow people to initiate conversations when they want, where they want, and how they want – giving your audience the control. 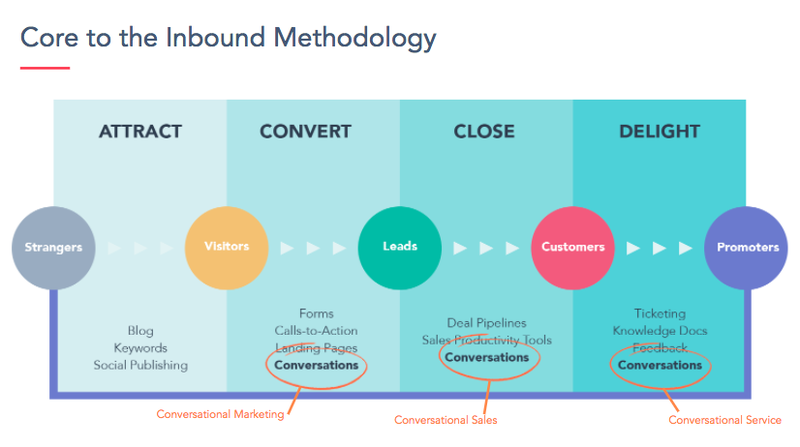 How do conversations fit into the inbound methodology? 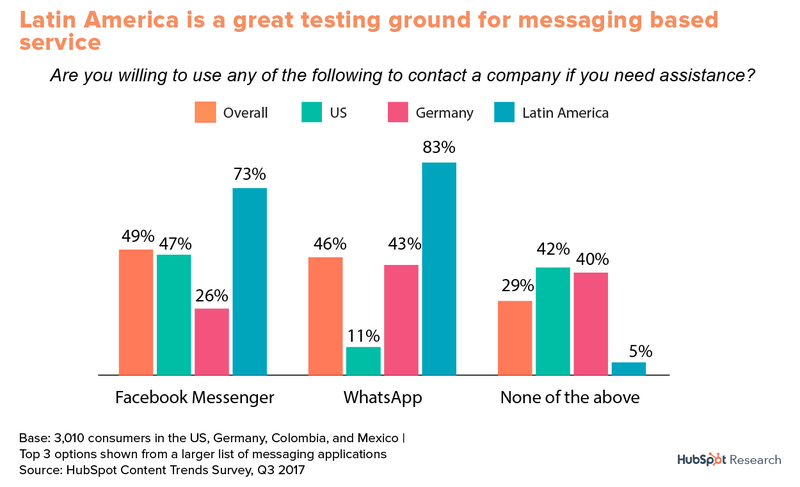 Well, we see conversations taking place throughout the entire customer lifecycle, though there’s not a strong case to be made for it in the attract stage as the discovery of brands on messaging platforms is still immature. Facebook Messenger’s Discover tab, which launched mid-2017, is one attempt at solving this. But conversations can be used in place of forms to attract and capture leads, by sales teams to convert those leads into customers, and by customer success teams to delight customers with quick and convenient support. For example, using live chat during the sales process could help convert more leads because it allows prospects to interact in a way they already prefer to buy. 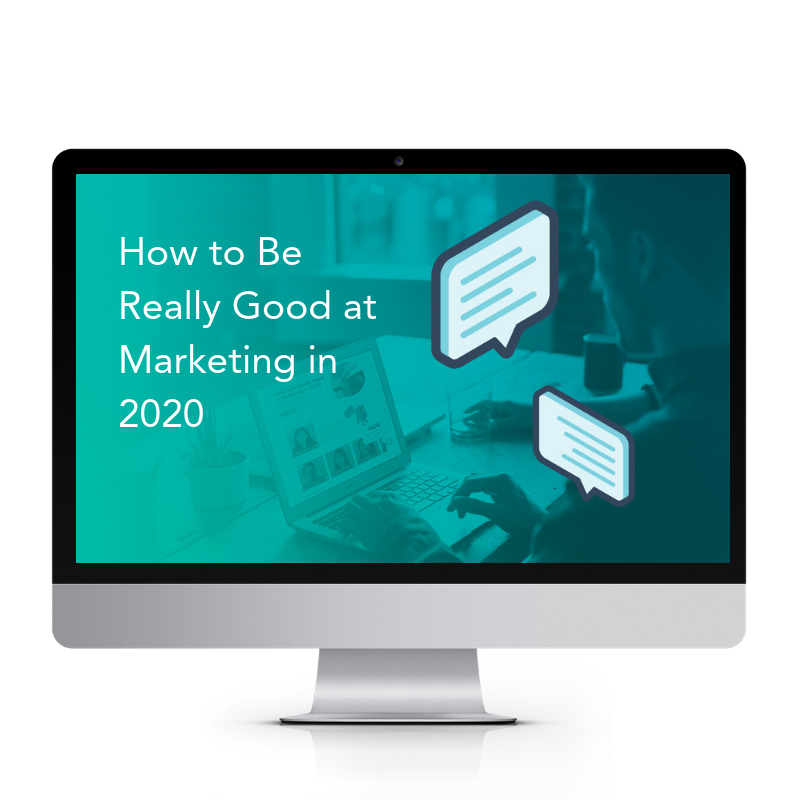 Okay, we know conversational marketing is all about improving 1:1 relationships, but how can businesses actually start to build out a strategy for success? Cirillo recommends starting with one goal and then working backward. “Know what you want to get out of the conversation and what data you need to make that happen. Every conversation should add value to your business,” he said. When you have a conversation with a friend, you don't expect to have to remind them of things like your name or where you live — the same holds true when customers have conversations with a business. That's why using a CRM is so important. A CRM is like a digital memory that allows you to have conversations with customers like you know them. A successful conversational marketing strategy is dependent on fast and reliable access to a shared knowledge base that includes data such as communication history and necessary customer information. Companies who want to do conversational marketing will need a way to store and organize that data in order to have more seamless interactions with customers. With the help of a CRM, you can organically promote events and products, distribute content, and provide support all through chat. So what data should marketers collect? You don't need to know everything about them, but you should know the basics and details of past conversations. Cirillo encourages marketers to think first about why they're using chat. "Success with conversational marketing will look different depending on the use case. There's not an overarching metric for this world. Track the 'time to solution' or conversion rate if you're solving for utility. If your experience is less about a particular action, then retention might make more sense,” he said. Start with what you want your customers to be able to accomplish via chat and then build out processes for acquiring the necessary information. In addition, you can’t implement a conversational marketing strategy without a process for tracking performance, moments of confusion or drop-off, and new questions. You should always be gathering data and optimizing the experience. Once your CRM is set up, it's time to think to think about how you can scale your conversations. This is where chatbots can help. Business isn’t just happening in one city, in one state, or in one timezone — it’s happening all around the world, every minute of every day. As I mentioned earlier, adding automation with chatbots is crucial in keeping up with a volume of conversations and to have a fighting chance at 24/7 support. Bots allow SMBs to compete with enterprise-sized businesses. Customers expect to be able to connect with businesses whenever they need to. According to research from Aspect Software, 65% of consumers feel good about themselves and the company when they can handle an issue without talking to a live person, and 61% think that chatbots allow for faster answers. Keep in mind that while chatbots can do many things, they should never be used as a barrier between customers and a human. 86% of consumers want the option to transfer to a representative if their request is too complicated for a bot to handle. Bots can't replace human talent, but they can help augment teams during off-hours or when conversation volume is too much for a small group to handle. When speaking with a customer or prospect, conversations should be personalized with relevant shared knowledge. Shared knowledge is the foundation of good conversations. Think about it: If you’ve already given a business you’re phone number, do you really want to waste time reciting it every time you have a simple question? Personalized details make the conversation feel more natural and help you to get to the root of the issue as quickly as possible. Conversations that have context not only improve the end-user experience, they also help minimize misunderstandings and get straight to the heart of the issue. Because you don’t have to waste time collecting information you already have access to, you’re able to provide immediate value. Context is necessary to help answer the right question, at the right time, in the best way possible. Conversations that aim to answer the most important question first will provide the best user experience. Even though it's a conversation, this isn't like a conversation with friends. When customers interact with your business, chances are they don't want to spend time talking about cat videos or their weekend plans. They want to solve their most immediate need in the fastest and easiest way possible. Spend time analyzing your interactions to determine what data will help improve your customer relationships. However, it's important not to get too caught up in personalizing your messages. While personalization and contextualization are important, standardizing elements of conversations helps bring a level of professionalism and consistency to your business. Conversations should be repeatable and predictable. Figure out your customer's most frequently asked questions and draft approved answers for bots and marketers to use. Repeating conversations will help automate, optimize, and improve future interactions. Predictable conversations help to users have a natural dialog with a clear beginning, middle, and end. Standardization is crucial to delivering clear, consistent answers, across conversations and users. When involved in a conversation, we often have to deliver the right answer before correcting the problem. For example: Let’s say you receive an email with a coupon code from one of your favorite stores. You spend a half hour scrolling through their products trying to decide what to buy, but when you finally enter the code to make your purchase, it doesn’t work. You’re understandably annoyed that you wasted all that time when you weren’t even planning on buying something without that code. The business should emphasize with your issue and assure you that they understand the problem before the can move forward with providing a solution. Emphasizing helps customers feel valued and heard. Finally, it's crucial to optimize. Learn from your past conversations so you can improve them in the future. Optimize for the strengths of the channel and for the answer – aim to provide answers that people would receive in a real, one-to-one conversation. For example, live chat or phone might be better for providing support, while Facebook Messenger could be a better choice for content delivery. Listen to your customers and observe their behavior as you build out your strategy and make changes where needed. Conversational marketing is an iterative process — what you thought might work may not always provide the best experience. Take time to ask your customers for feedback. Their advice will help you delight your next customer. Remember, every conversation should be impactful and help add value to your business. Phew, you made it to the end. Good convo guys. We've come a long way from letters and telegrams. For the first time, people are having meaningful conversations with businesses on a massive scale thanks to automation with bots, a CRM, and new channels. Conversational marketing is changing the way companies talk with their customers by making interactions seamless and faster than ever before. Your customers are having conversations. Why not join in? The most important things to focus on are the channel, the conversation, and how the strategy fits in with your overall inbound marketing strategy. Channels should be simple for businesses and consumers to use, conversations should follow a clear process and serve a purpose, and your inbound marketing strategy should inform your conversational marketing strategy. Remember, humans have been having conversations since the beginning of time. Technology is only making it easier and more productive for businesses and their customers to connect. While the days of communicating by the Pony Express may be over, thoughtful, friendly conversations (and gossip) will continue to stand the test of time and technology.